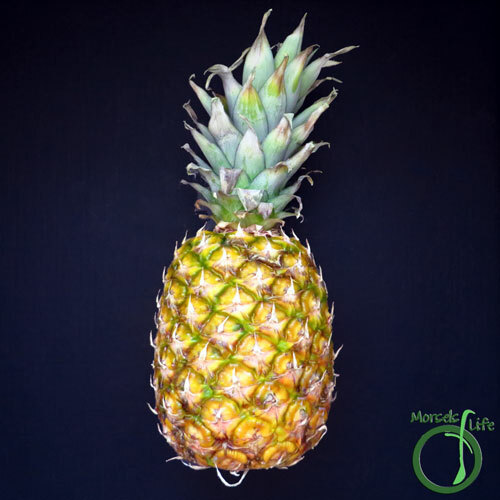 Did you know each pineapple is actually composed of many flowers with their fruitlets fused together around a central core? Each flower leaves behind an "eye." So now you know why there's so many of those spots on a pineapple! Anyway, back to cutting pineapples. You'll want to cut off the top and bottom first since it'll make cutting the skin off simpler. You can also grow another pineapple by planting the top if you want! 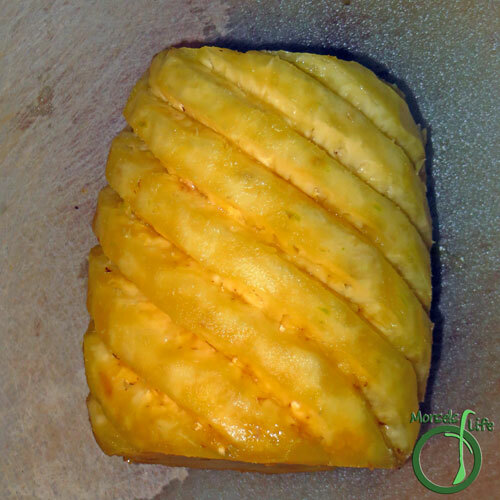 Then cut away the skin from the sides of your pineapple. 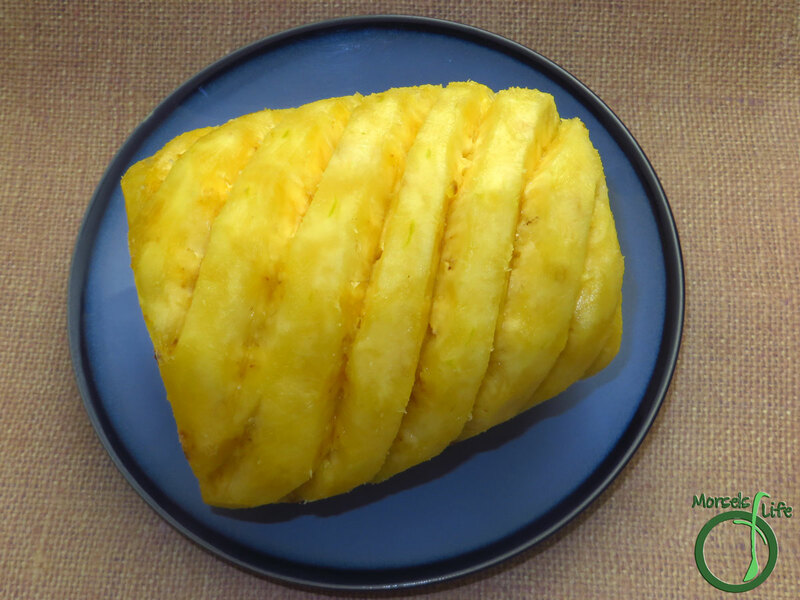 There's two basic ways to go about removing the skin from the sides - cutting in far enough to remove all the eyes or removing as little skin as possible so you get to eat more of your pineapple. If you've removed all the eyes with the skin, you're ready to cut the pineapple for eating. 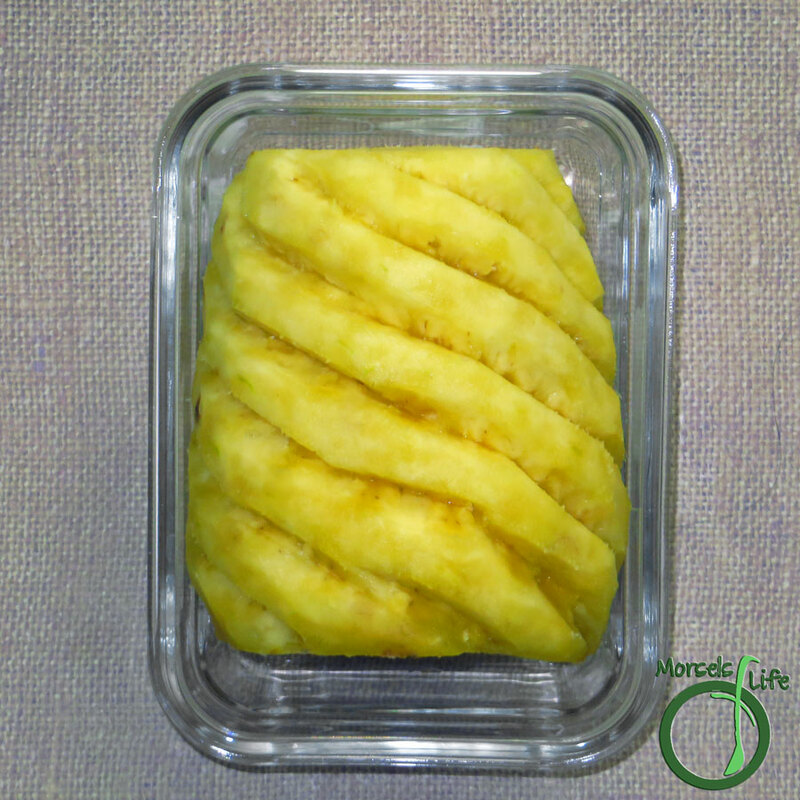 You can also use the stuff you removed to make pineapple vinegar! I will usually still discard/plant/compost the top and bottom and just use the sides and core for making pineapple vinegar. If you decided to keep as much yumminess as possible, you'll want to remove the eyes. Fortunately, the eyes are organized into lines, so it's not too hard to cut them out. Simply take your knife and cut a few out at a time. You can also cut out each eye individually. Just work your way around the pineapple, and before you know it, you're finished! I like cutting them out on the diagonal since it looks prettier and doesn't take as long. 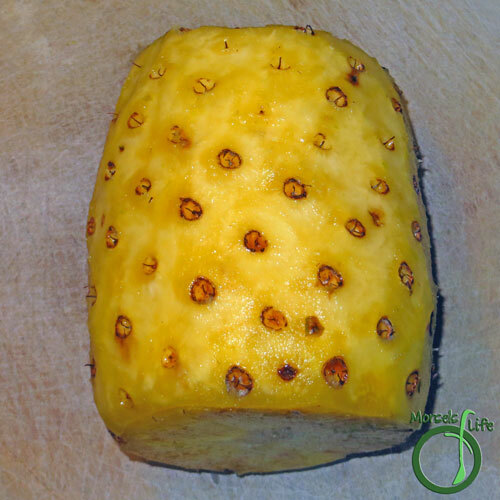 :) I first realized you didn't have to just slice off large portions of the skin, losing all that yummy fruit in Thailand when I saw pineapples cut with the spiral pattern. Plus, doesn't it look fancier? More pineapple and prettier appearance sounds good to me! What's a fruit you're not sure how to prepare? 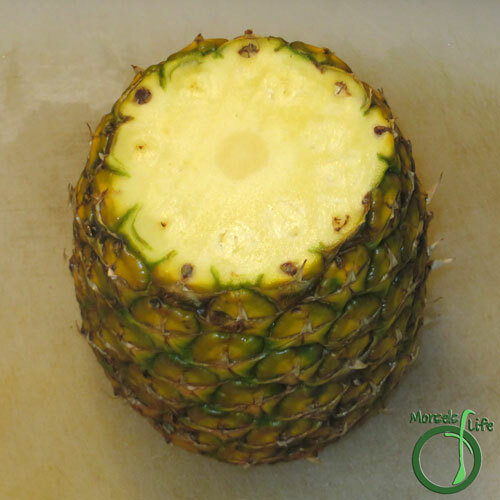 Find out how to easily and efficiently cut a pineapple. 2. 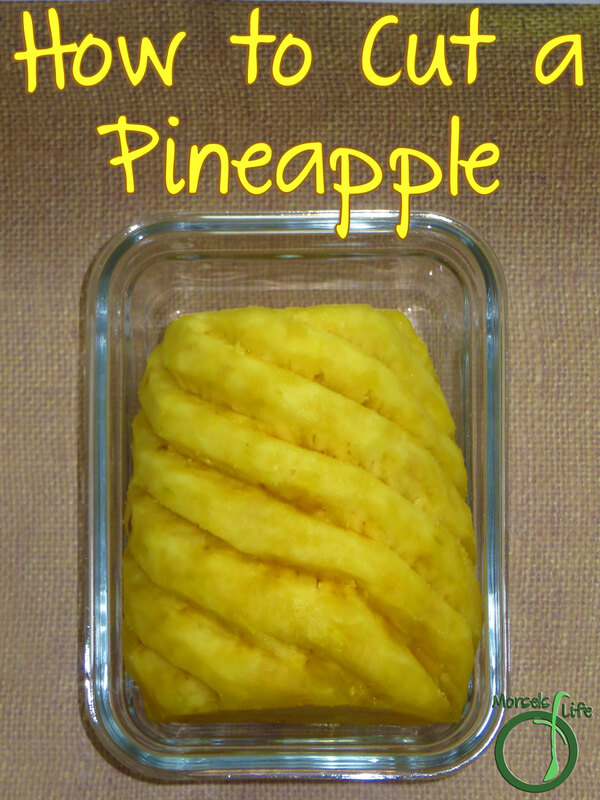 Slice off top and bottom of pineapple. 3. Cut off the skin from the sides. You can cut deeply enough to remove the eyes, or just the skin. 4. If you've already removed the eyes, you can skip this step. If not, cut out the eyes. You can either remove each eye individually or on the diagonal. I think removing the eyes in a line balances removing as little flesh as possible without spending too much time. You're now ready to cut your pineapple into slices!